Quad-Core CPU: The MT6735 Quad-core 1.3GHZ high-performance processor incorporates smart systems, which allows our smart mirror to run faster, smoother and more stable compared to Android 4.4. ZeroBlind Area：Our smart mirror has NO blind spot rear view angle which helps you see all of your surroundings behind you. It will not block your sight even on rainy days especially when you are reversing, which other mirrors cannot achieve. NO worries about the obstacles on the back seat anymore. Our mirror dash cam enables you to drive safely! Full HD Streaming Media Display: The very clear and smooth display streams images and video crystal clear on our Auto Adjusting Brightness Smart Mirror. Delivering an ever incredible user experience! Smart Rear-View Angle Switch: Auto Adjust rear view angle view while driving or parking. This allows you to see all the vehicles and objects clearly behind you while driving. It also lowers the rear view angle automatically to show you a closer backup image while parking. Zero blind spots ensure you can drive without worry! Dual Cam Simultaneously Recording: This Smart Mirror has two cameras that allow for simultaneously recording videos from two different angles. When you're ready to reverse simply press the rear camera button or set it to switch automatically when reversing. Our smart mirror will then switch to the back-up camera view with the parking assist lines. The Best Super Night Vision and Crystal Video Quality:Unlike other dash cams that send blurry dim images, our waterproof and super night vision backup camera uses AHD technology, giving you 720P very clear and bright images of everything easily at night or on rainy days and enjoying 1080P FHD digital image by front camera all the time. Records dual videos and takes front&rear view pictures at the same time. No more worries about missing any beautiful scenery on your journey! Full 3-lane Coverage with 120° Wide-angle Lens：In order to reduce blind spots, this smart mirror camera uses a 120° ultra wide angle all-glass lens, which monitors 3 lanes comfortably. The camera is highly sensitive, enabling accurate and detailed capture recordings. 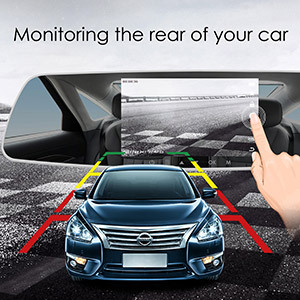 Parking Monitor & G-Sensor：Triggered by the Parking Monitor, the dash cam front and rear will automatically turn itself on and record when parking. The integrated G-sensor will auto-lock recorded video for safekeeping when a collision is detected. Equipped with these powerful functions, 7 inch dash cam front and rear provides powerful evidence in case of dispute and gives you peace of mind when driving. Easy To Install: There's no need to remove the original rear mirror, just pop it on over the existing rear mirror. The initial rear mirror won’t get damaged due to the design and padded back of the smart mirror. When the SD card is full, the smart mirror camera can automatically cover the earlier segment. 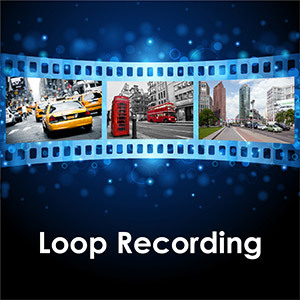 With loop recording enabled, you never have to worry about buying additional cards when capacity is full. The built-in gravity sensor, when the collision occurs, the car recorder will activate, it will recorded the video and locked. Locked images and videos are saved in the sd card, and those files will not be overwritten. This dual dash cam can monitor when the vehicle is parking. If this is used for a long time, extra power is recommended to supply the car camera. This backup cam will display gridlines to help you effortlessly guide your vehicle when reversing, which can help you avoid rear collisions or unexpected objects with the rearview camera. Sensitive touch screen, it is convenient for operating the switching mode, any problem, you can tell us. LCD dual dash camera: The HD mirror cam works great day or night. 1080p HD view, can capture the license plate at day time. The dash cam also features night vision, LED with 4LEDs light can provide the clarity and safety needed for night driving, reversing or parking. Waterproof rear camera, you can use it normally in the rain. 3.6" high definition LCD screen. Supports IR light night vision. Small size, convenient to carry and easy to use. This camera is great for capturing video of traffic accidents and reporting dangerous drivers. Fits easily over your stock vehicle's existing mirror. This product can be used to prevent scraping the car, traffic collision, and other advantages. Professional driving recording can guarantee your safety and interest. Help you drive carefully and safely, eliminate blind spots, and have no worries of backing a car.